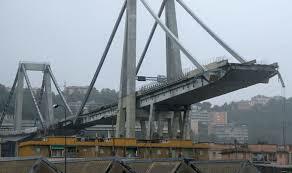 Genoa: Heavy machinery has begun winching down a huge slab of concrete in the northern Italian city of Genoa to clear the way for a new bridge to be built after the old one collapsed six months ago, killing 43 people. Italy’s populist government has made the reconstruction of the roadway a priority, with Transport Minister Danilo Toninelli saying at a ceremony marking the start of the demolition that the project would be “the image of Italy’s revival”. A 200-metre-long section of the bridge gave way in August of last year, sending dozens of vehicles into free-fall and severing part of a motorway linking Italy with southern France. The Morandi bridge, opened in 1967, is also a vital link within the seaside city, and without it the activity of the busy port has been put at risk. The new bridge will be opened next year, Toninelli said, which would be a record-setting pace for construction in Italy, where major infrastructure projects often drag on for years, plagued by corruption and bureaucracy. “This marks the relaunch of Genoa, Liguria and Italy,” said Prime Minister Giuseppe Conte, who spoke before demolition began. Italy sank into its third recession in a decade in the second half of last year. The reconstruction process, which is expected to cost as much as 230 million euros ($261 million), may provide a welcome economic boost. Famed Genoa-born architect Renzo Piano, who designed the Centre Georges Pompidou in Paris and The Shard in London, donated a proposal for the new viaduct and has agreed to supervise the works. After the bridge collapse, the Italian government blamedoperator Autostrade per l’Italia, which is controlled by the Benetton family, for poor maintenance and threatened to revoke the group’s concessions. Autostrade and its top managers are under judicial investigation, along with transport ministry officials, for culpable homicide. The company denies any wrongdoing. The reconstruction contract has been awarded to Italy’s biggest builder Salini Impregilo and shipbuilder Fincantieri.